In many areas of technology dimensioning takes place up to a technical tear (crack length approx. 0.1 to max 1 mm) and the component should not be used beyond this tear point. The reason is that the number of cycles between the initial tear and the complete failure of the component is very short (approx. 5 to 10% of the total fatigue life). The unfavourable relation of use and risk makes any further use inadvisable. Even when it is not intended that a component with a tear be used, the question often arises whether the function and bearing capacity of safety-relevant components are still maintained when there is a tear and what the remaining fatigue life is. This assessment is particularly of interest to ensure durability should a defect occur which could not be found with certainty without tests which would destroy the component. . It is a different situation with aviation and space technology where lightweight constructions of aluminium alloys are used. Here the number of cycles between the initial tear and failure is much larger and it is common and acceptable to use components with a tear. It is, however, important to know the phase of crack growth and to be sure that the cracks are found during inspection before failure. Crack propagation analysis is therefore an important measure for determining the inspection intervals. When analysing and reconstructing the damage, it is also often important to be able to estimate the crack propagation. Damage experts must be knowledgeable on this subject. In winLIFE there are only a few methods for calculating crack propagation but these are sufficient for estimation. These provide a helpful addition to the calculation methods up until the tear. 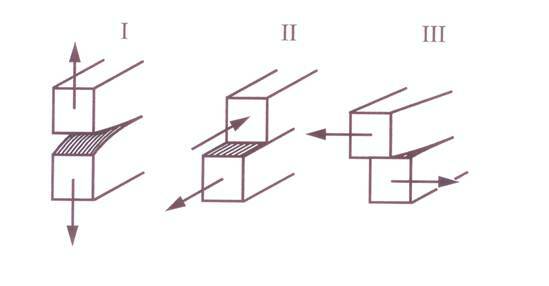 Linear-elastic fracture mechanics are used for completely or nearly brittle material behaviour. If there is an infinite plate, Y has a value of 1. The graphic shows that the geometry – in particular the height-width relationship – as well as the crack length is important. 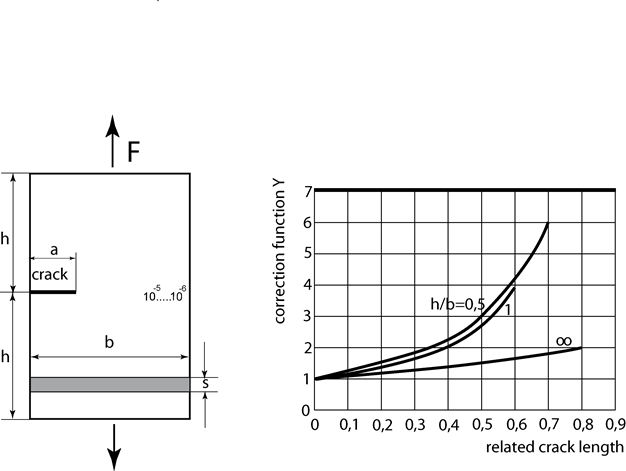 If the process described here is used, and the gross nominal stress is used as a basis, then the correcting factor curve is important for every cross section. There are correcting functions for a number of geometries. If a real component is available, a similar reference component is taken as from the data base. If this is not possible, then proceed with the aid of FEM. Crack propagation is caused by the stress field in the area around the tip of the crack. 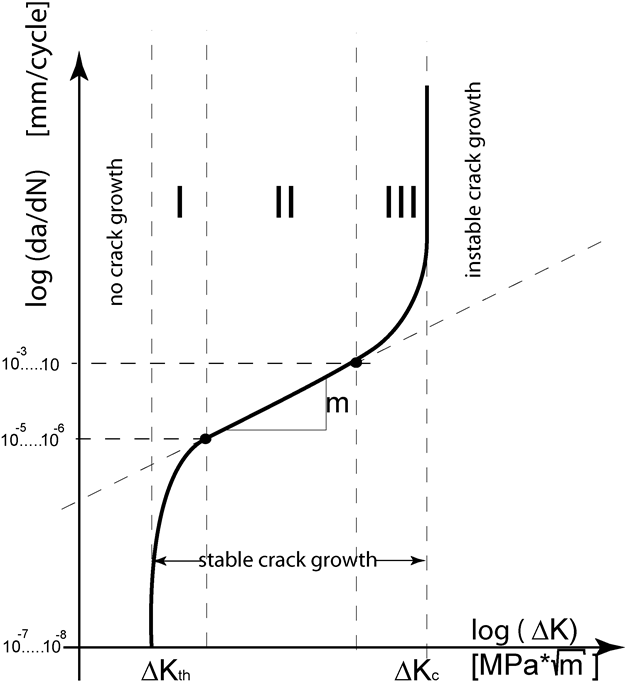 Of the three types of crack-related stresses the predominant one is the so-called Mode I, which is usually relevant for crack propagation. This case is implemented in winLIFE. The other two types, Modi II and III which are relatively seldom, have (for the time being) not been taken into consideration but will be included in a later version. If C is given for the unit system MPa m1/2 you must multiply C with the factor 0,031623m to get in in the unit system which winLIFE uses. If is given in the unit MPa m1/2 you must multiply this value with 31,623 to get the unit Nmm-3/2 which is used in winLIFE. Data requirements: Material constant Co and m.
This is without the influence on the calculated crack propagation but it is often necessary if the past load history is to be included Usually No=0. The correcting function takes into account the geometry and the crack length. Due to The changes in the crack length a, the correcting function also changes. The correcting function can only remain constant if the intervals are short. The crack propagation dl is determined according to equation 3. Note that the change to the length of the crack also leads to a change of the stress intensity K and the correction function Y. The sequential load order is therefore very important.